A 15-minute walk from Vieux-tours and Plumereau Square, Mercure Tours Centre Gare is located in the city center, 5 minutes from the SNCF train station and Congress Center, and 15 minutes from the fairgrounds and Grand Hall. With free wifi in all its spacious, soundproofed and air-conditioned rooms, you can relax during your business stay or even leisure with your family, in the Loire castles region. The hotel is ideally located, just 5 minutes from Tours SNCF train station, the Vinci Conference Center, the Tribunal d'Instance (District Court) and a few minutes by foot from the old town and its stores, Tours exhibition center and the Grand Hall. 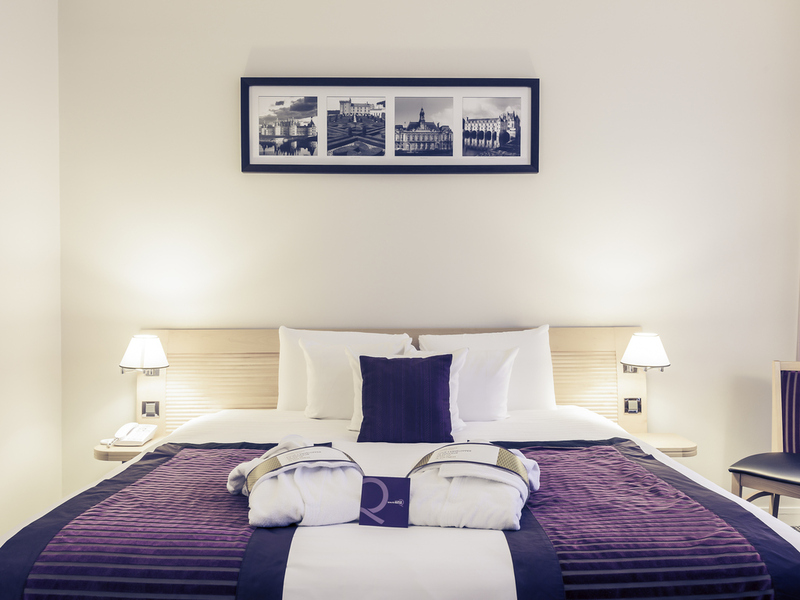 In the heart of the Loire Valley with its castles as well as being 55 minutes from Paris Montparnasse by TGV, the Mercure Tours Centre Gare welcomes you to its spacious and soundproofed rooms for business or for leisure time with your family. During your weekend leisure break or business stay, come and visit the old town of Tours, the Saint Martin Basilica, the Museum of Fine Arts or the Touraine Aquarium. Classic Room - twin beds. Our Clos Lucé bar welcomes you at the Mercure Tours Centre Gare et Congrès. It is perfectly suited for your business meetings, relaxation, or for sampling regional wines and products. You will appreciate the cozy club room ambiance in our lounges. Welcoming staff at reception. Very clean and comfortable a short walk from the old centre of Tours. Breakast was a really good selection and good quality. The only negative was that air conditioning was not very effective. Upon arriving at the hotel we were greeted by a gentleman on reception who was excellent. We have stayed at many hotels over the years but we have never received such welcoming, proficient, friendly and helpful service nothing was too much trouble. The room was spotlessly clean and even though the room was overlooking the station we could not hear a sound. Full mark's to this hotel it was everything a hotel and service should be. It was not a true standard Mercure Hotel, as the security doors in the corridors showed, it was an extension of the Ibis BUDGET hotel next door. Lacked room facilities. Although it was clean and large. I experienced, one of the worse breakfasts I have encountered in the many hotels I have stayed in. Staff very friendly but many lacked experience when things went wrong. I would never stay or recommend to anyone to stay in this hotel. Good operation - They anticipated and met my basic needs. I was expecting to be treat As a platinum member of Accor club. I was not even able to pay with my Accor rewards. Friendly staff however the room was hot and no aircon, even with the curtains closed due afternoon sun the room was stifling, had the windows open then subjected to the trains passing outside. The staff did offer to move us however had already settled in so did not take them up. Wifi good when available however frequently dropped out. Room large, clean and comfortable. Beds overly soft, think there was a quilt underneath us so no support when sleeping. Wifi dreadful, the worst we've had in a Mercure. We managed to sign on in the evening, the connection was very slow and then dropped out and wouldn't connect at all the next morning. breakfast mediocre, not a lot of choice. Air con not controllable enough, just 2 switches. Excellent. Nice facilities. Friendly staff. Good points. Bed was extremely comfortable. Breakfast nearly perfect (No toaster & need a 2nd coffee machine.) Staff on reception at check in and check out both excellent. Bad points. Parking in underground secure parking Code for 2nd entrance isnt correct. Free parking very limited. Bedroom dated, carpet very worn, toilet needs replacing. Bed and bathroom very good. Shower was rubbish though. Very overpriced considering its location isnt the greatest, previous night in Novotel Vallodalid was cheaper and miles better and the inbis in Salamanca was also better IMO. Excellent. Friendly service. Good large room. Very good breakfast. Good secure car parking. We had 3 interlinking rooms which worked brilliantly for us as a family of 5. The bathrooms were a bit old and one of them was not very clean, it had hair in it. Great room, and bathroom. Note no restaurant, but close enough to town centre to easily find a range of different restaurants. Very clean room, staff fantastic and very friendly, parking available at no extra cost. Would recommend to anyone visiting Tours. Clean and comfortable hotel located near the train station. Good breakfast selection. Unfortunately there are no restaurants close to the hotel, and as the hotel does not do dinner service a trip to the town center is necessary. This is 10-15 minutes on foot. Good location, amazing staff, large, clean room with tea-making facilities, excellent continental breakfast. As the title says &quot;Simple, clean, spacious, great value and good service&quot;. Impressed by friendly staff and tasty breakfast. Stayed here as a stop over towards Southern France. Extremely helpful service at reception and the whole time we were there. Hotel near the station of Tours were we stayed in a family room consisting of 3 rooms, each with a bathroom. Clean but somewhat outdated. Unpersonal check-in, but was compensated afterwards by more personal approach. The hotel was welcoming as always and was clean and comfortable. We were greeted by the reception staff in a very friendly manner and the check in process was nice and easy. The room was of good size, clean and tidy. The beds were very comfortable. The bathroom was spotless and had a nice powerful shower.